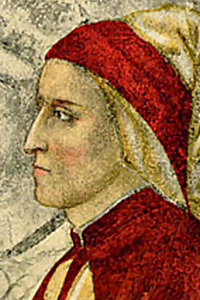 Mediaeval Italian poet and prolific writer, Durante degli Alighieribetter known as Dante has been styled the "Father of the Italian language". His 14,000 line allegory, Divina Commedia, is widely considered the central epic poem of Italian literature. Written in the first person, it tells of Dante's journey through the three realms of the dead, lasting from the night before Good Friday to the Wednesday after Easter in the spring of 1300. It was not until the mid-nineteenth century that a group of writerslabeled the "Followers of the Veil"1 by Umberto Ecobegan to promote the idea that Dante was a freemason. 1. L'idea deforme: Interpretazioni esoteriche di Dante, M. P. Pozzato (ed.). Milan : Bompiani, 1989. 2. The literary in theory, Jonathan D. Culler. Stanford University Press. p. 168. 3. Interpretation and overinterpretation, Umberto Eco, Stefan Collini, Richard Rorty, Jonathan D. Culler, Christine Brooke-Rose. Cambridge : Cambridge University Press, 1992. pp. 54-55. 5. Gabriele Rossetti : A Versified Autobiography, W. M. Rossetti, pp. 65-66. Cited in "Britain's Tribute to Dante in Literature and Art; A Chronological Record of 540 Years (c. 1380--1920)", Paget Toynbee. 72 London : Oxford University Press. Source :archive.org, accessed 2009/07/05. 6. Detail of painting by Giotto Di Bondone (1267-1337).